You’re a popular person. Your friends are planning awesome things: interpretive performances, LOTR marathons, cupcake cook-offs, and steampunk weddings. They want you there. Have you RSVPed? When asking people what etiquette faux pas bothers them the most, the 2nd most received answer (behind cell phone use) was those who don’t RSVP. Ever since Facebook has created the “maybe” option on their invite forms, people have stopped giving definite responses to invitations. We even had a handful of people that never RSVPed to our wedding (which I hear is becoming more common). If you received your invitation by e-mail, then an e-mailed response is acceptable. If the invitation is to a wedding and includes an enclosed card, then send your response by mail. You can judge the required response by the formality of the invitation itself. Generally it is best to reply as soon as possible. For written invitations responses are made within several days of receiving the invitation. For in-person or phoned invitations, you may provide your response when asked or await until you have checked your schedule. Simply let the person know that you will call as soon as possible. There is no need to go into great detail if you must decline the invitation. Write a simple and polite note of regret. If you feel like you must offer an explanation, be sure it is brief. If you would like to accept an invitation to an informal or casual event but have a tentative conflict, contact the host or hostess to explain the problem. If the event is formal, however, your delay might inconvenience the host, so it’s best to decline the invitation. If the invitation does not specifically request that you RSVP, then a response is not necessary. However, it is always polite to notify the host when you cannot attend. A phone call will usually suffice, though you might send a personal note or an e-mail. Did you get a Facebook invite? “Join” or “Decline” as soon as possible. Not sure if you can make it? You can click “Maybe”, but try to keep it there for only a day while you straighten out your schedule. Any longer than that, send the host an email or make a note on the event as to why you may not be able to show up. DON’T “join” or say “maybe” if you know you can’t make it. Whether you’re being passive, trying to show others that you’ll be there, giving yourself an alibi, or showing your support from afar, it doesn’t matter. It gives the host a false number to work with. Wouldn’t you be upset if you made a bunch of zombie cupcakes, and no one showed up to eat them? My challenge to you this week: Go through your Facebook events (or outstanding email invites and wedding invitations) and RSVP to ALL of them. Try not to put “maybe” for any of them! 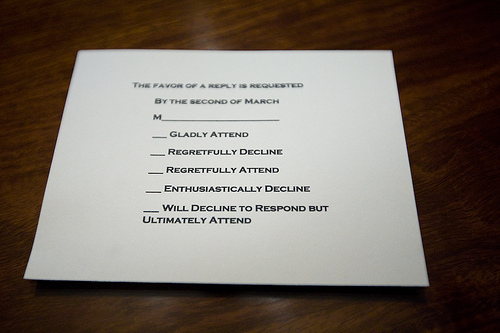 Have you had difficulties getting people to RSVP? Any tips or tricks?